So I wanted to make this post up for a few reasons. One, a lot of us here at racefriv are previous builders of the Georgia Southern Formula car. Russel, Parker, (and other great friends) got the program back on its feet after it was left idle for a few years. Two, because if there is a younger crowd reading this then I highly recommend that if you end up at a college with an Formula SAE team to join it and enjoy it. I learned much more of what I wanted to learn through this program than most of my college classes. Third, because the car is badass; it's a car- made from scratch, by a bunch of intelligent guys that just wanted to build and drive a racecar. Isn't that all of us? So recently at some drift events, I was giving a few people some rides showing them what the old '86 can do, and what do you know-the kid in the passenger seat was currently on the Georgia Southern Formula Motorsports team and was helping build the 2011 car. Awesome! So we talked and he sent me some pictures and some specs and showed me what they had been up too and, WOW, it's about 1000 times better then our sad little car when we first started. These guys really know what they're doing and, that's awesome. It's really good to see where the program has gone since I've left, especially since it really went uphill! Formula SAE only lets you use cars for a couple of years then you have to build a new chassis, which is an awesome rule. It keeps the chassis fresh and makes it to where almost all of the students joining get to understand and think about how to build a chassis. The car is designed and built from scratch. These cars are designed by the students, then they raise the money, then they get to the shop and build. The rule book for Formula SAE is nothing short of War and Peace, so it is no easy task completing a car, most teams dont even pass tech their first year. Luckly the Eagle Motorsports team has learned from its past and has done quite well in recent events. If you're lucky you may see them around some local Auto-X events getting the car fine tuned. 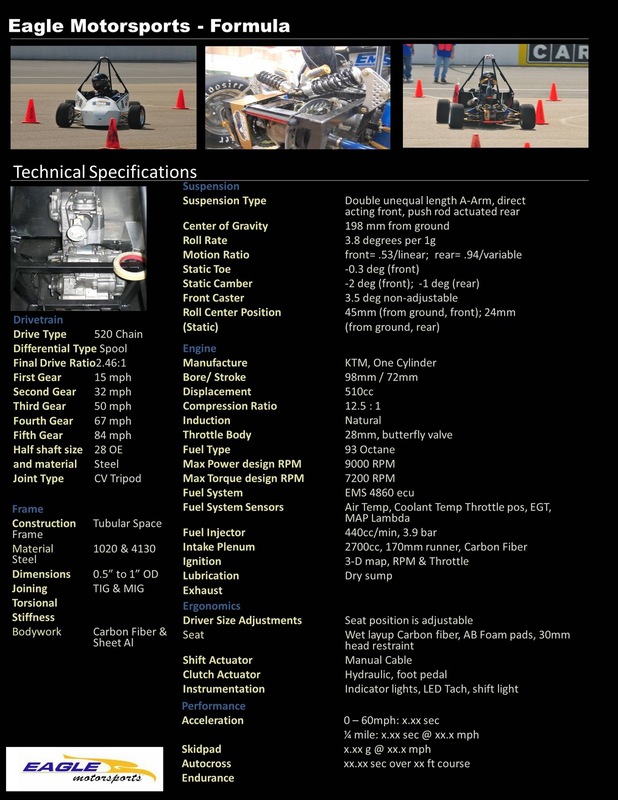 Here is a full spec sheet on their 2011 car running a single slam KTM motor. Sick!! They also do Baja SAE and if its more of your thing ( I did both, couldn't get enough) then go for it. Awesome post dude. I missed FSAW and Mini baja both! Watching the past 2 or 3 SAE builds as a fellow student, one of which was the car you guys worked on I am glad to see it has continued to go strong, watched one of the tests last month in the PAC parking lot. Always nce to see Eagles doing their thing.